My stamp club made this banner a week or so ago. I made mine in blue and then another one in my favorite color purple(post tomorrow). Others used red and green which I was surprised those colors looked great since I do not think of them when I think of snowflakes. I hope you can see the details in this. It is hard to get a good photo. A few close ups. 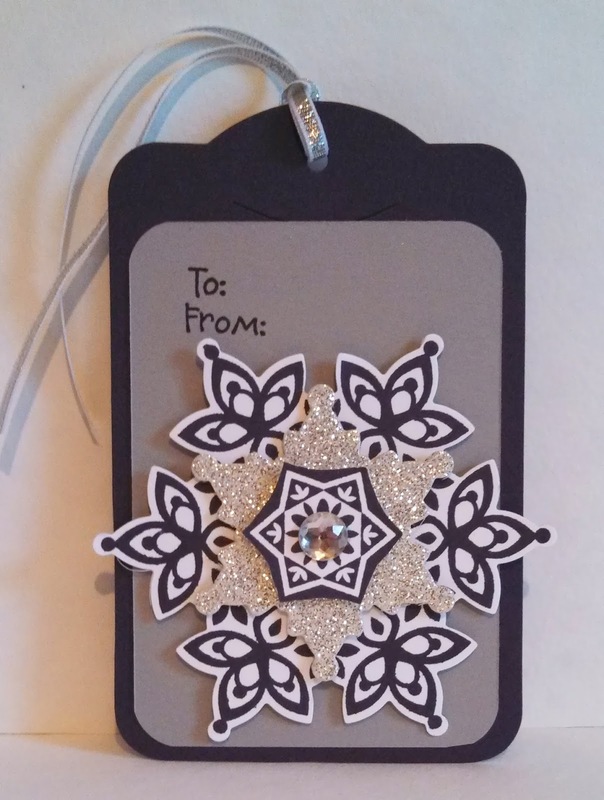 Love all the blues and the glitter paper! Enjoy your Saturday and thanks for stopping by! 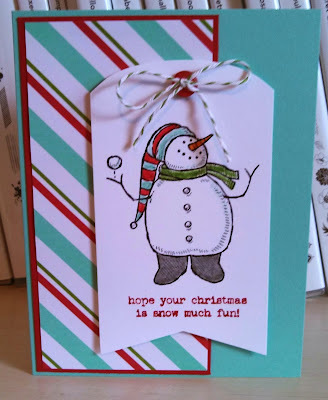 Great Sketched and I would have loved to make something with snowflakes but I am done with Christmas cards for now. I need more birthday! 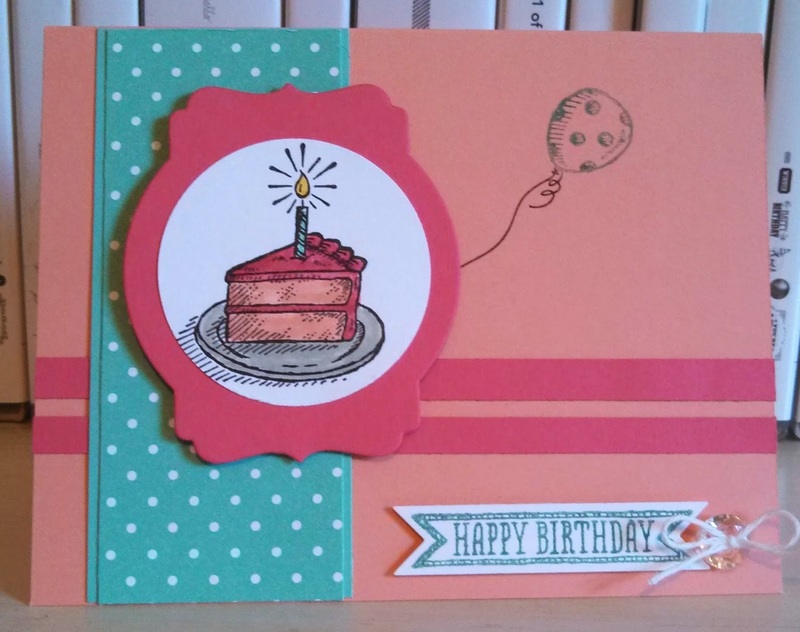 So I started with this Sketched Birthday set and then thought of great bright colors like Coastal and Strawberry together. It came together quick and hopefully my sweet 15 year friend will like it very much! Thanks for stopping by and have a blessed Friday! Ink: Coastal Cabana, Strawberry Slush, Crisp Cantaloupe, Daffodil Delight, Black Black, Sahara Sand and Black StaZon. 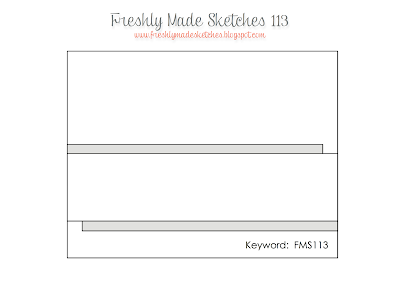 Cool sketch from Nicole Watts this week! I decided I would get some help from my designer paper for this one! 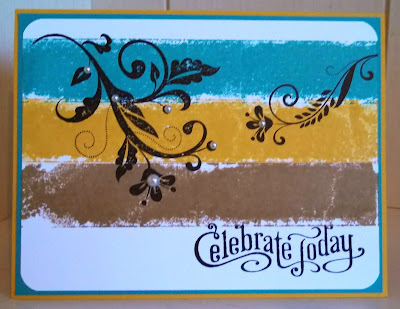 It really turned out well and then I thought I would stay with the modern feel, so I choose this stamp set and I thought it turned out rather cool or groovy or at least interesting to look at! I really hope you and yours have a safe and blessed Thanksgiving! Thanks for stopping by with that second piece of pie! My Season of Style This & That Journal! I keep pretty intense records from every Christmas. I do not know if I am alone in this but I can go back to my daughter's first Christmas and tell you what we did, what I bought that year for gifts, decor, etc. and what gifts we received. This will be her 19th Christmas, so you can see I have a large notebook full of info. Well this year I decide to start recording some things in my This and That journal. I decorated the cover with the help of SU! Season Of Style Designer Journal Tags. 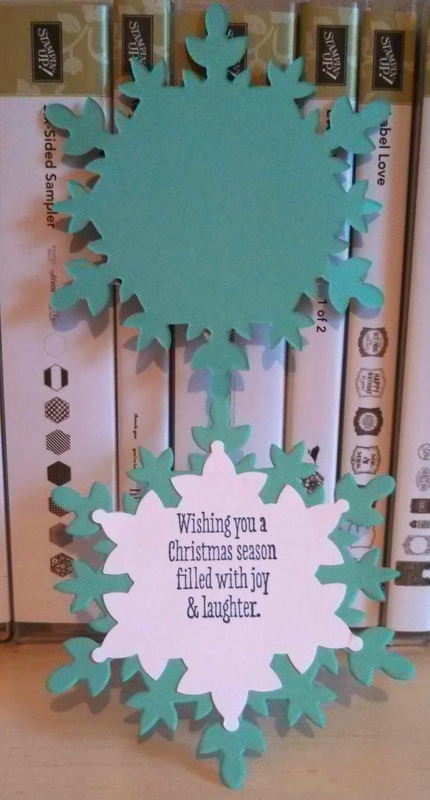 These were a gift from my friend Patti and made this task easy. You can purchase sticker for inside and my fav sticker on my calendar is for Cyber Monday (this year Dec. 2nd). It just says Cyber Monday then a check box for Pants and a check box for No Pants. I checked no pants for that day!! Really I will be at the gym (with pants on) and then gearing up for my annual tags class on Tues. Thought I would share as we have only 4 more weeks until Christmas so planning is key!!!! Hope you are ready for a wonder Thanksgiving Day! 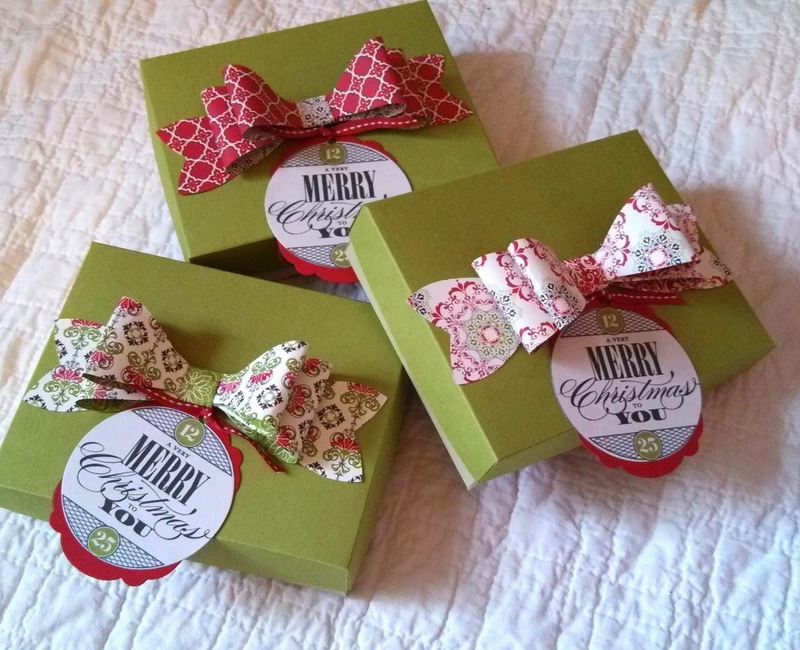 This past week at Stamp Club we made a hanging snowflake banner (photos to come) and these cute Envelope Punch Board Candy Wrapper Boxes. 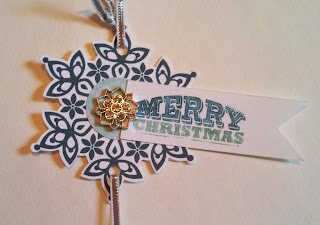 The idea is from Connie Collins at www.constantlystamping.com. Love this idea and her directions! It can be made in many different sizes. The one above is using 4 1/2" x 6" designer paper. There is some scoring and then punching with the Envelope Punch Board. You can fill with candy like I did or other treats/toys. 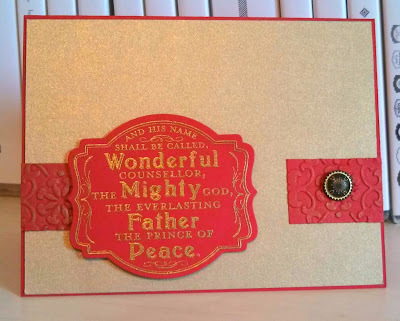 I made a band that wraps all the way around and is stamped with the O Holy Night set. Real easy to do! 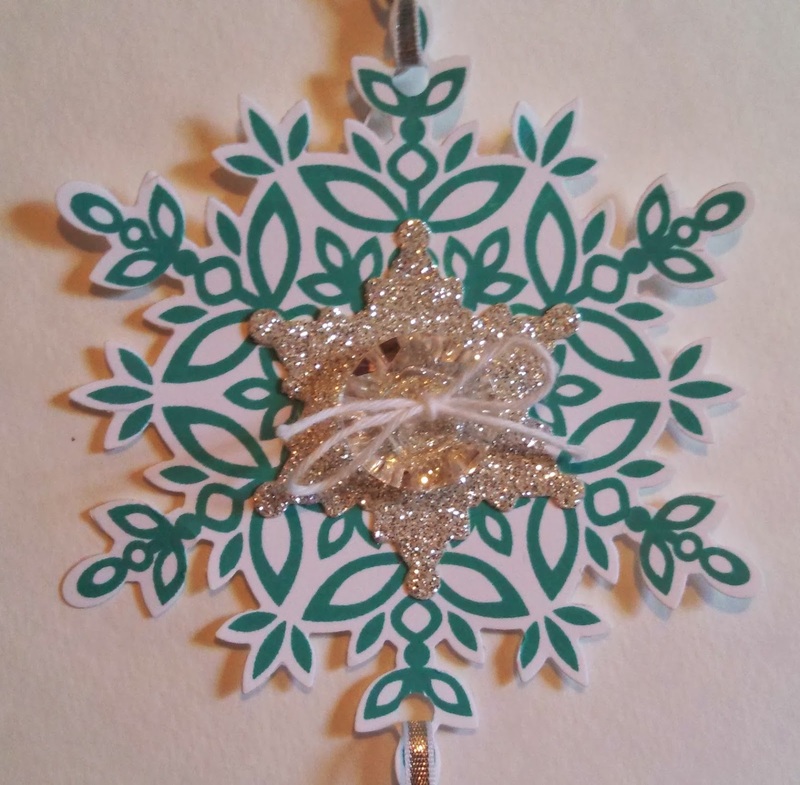 A tag or other decorative item like a snowflake could be made to decorate the box. 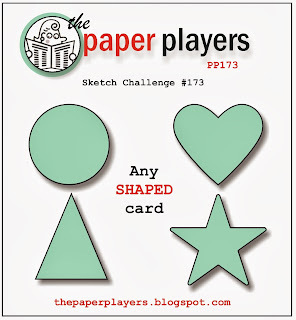 Love The Paper Players challenge with a shape. 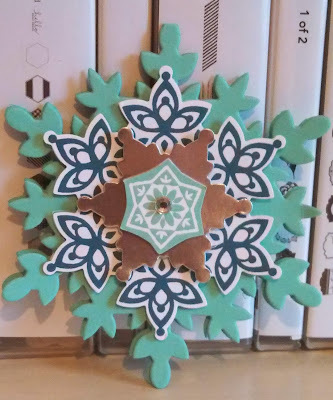 I happen to be looking at my Festive Flurry dies when I finished reading what the challenge was so knew I was going for a snowflake shape! Love all the blue shades together with silver this year so stuck with those combos. Finally got to use some my new silver foil. 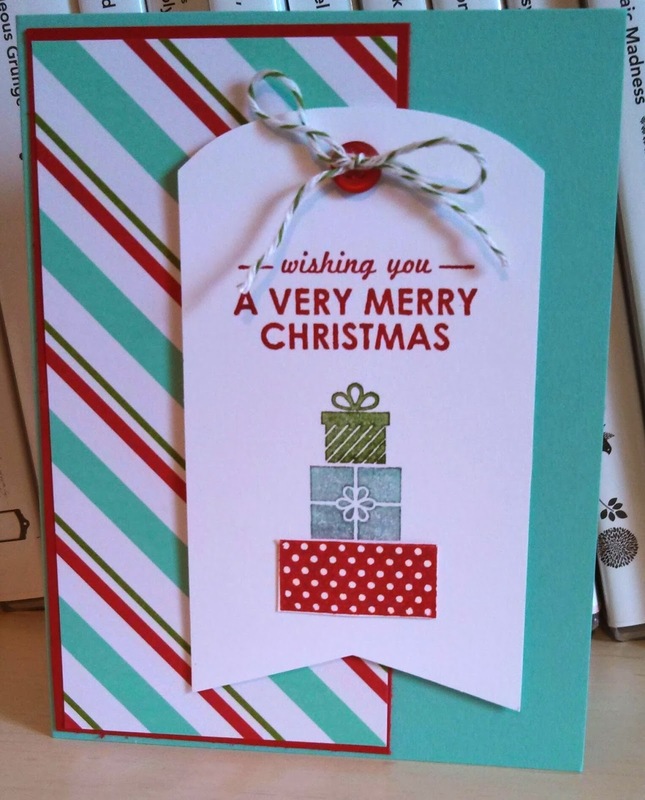 I will probably enclose this card in with a gift for a teacher. I decorate my Christmas tree each year from top to bottom in purple and silver. My favorite color is purple and I love the tree. I also wrap all the gifts in purple and silver paper and bows so my gift tags, of course, are the same combo! 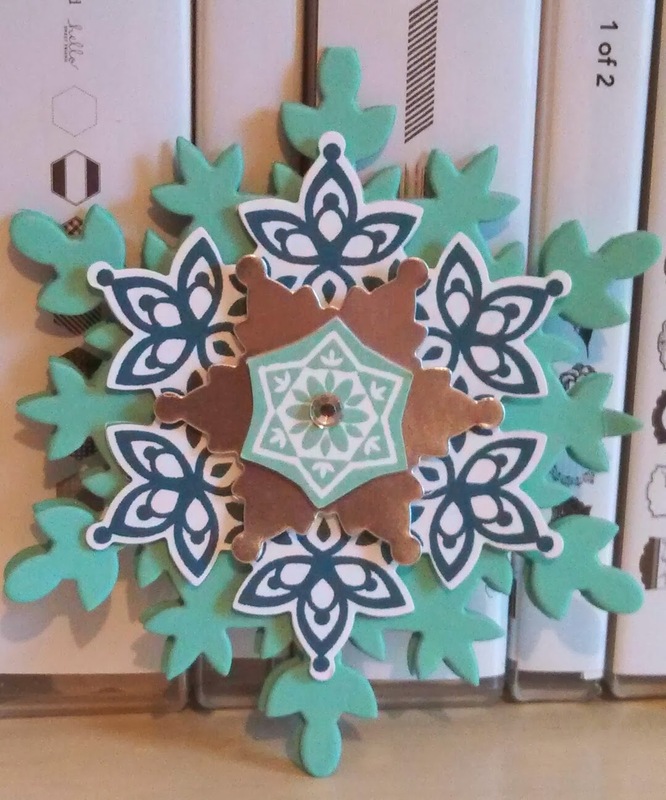 But this year I can do the snowflakes on them since we have a matching die and they are so fast to cut out! Have a wonderful Sunday and thanks for stopping by! I really like the sentiment here from More Merry Messages. 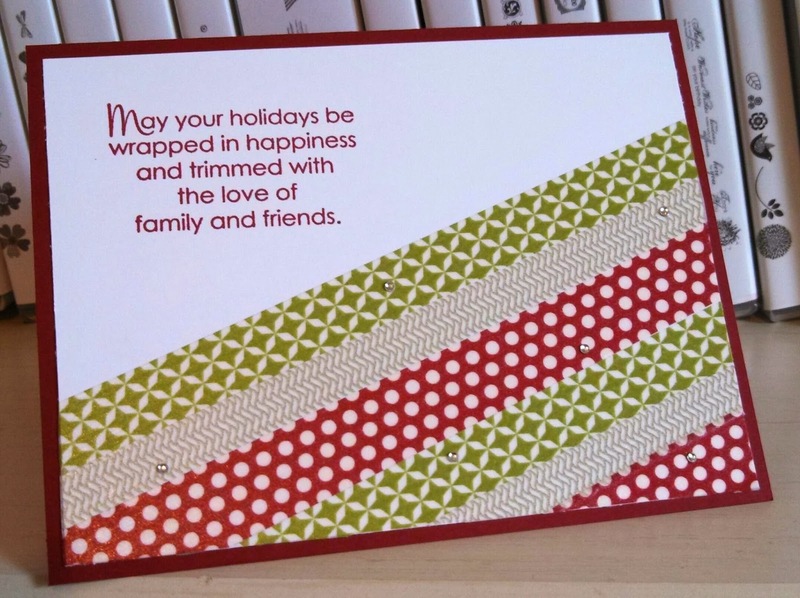 It is something you would stamp inside the card but it really went with the washi tape here on the front. I am trying to play more with my tape but the holidays are gone and I have a bunch left! I always tend to hoard things like DSP and ribbon! 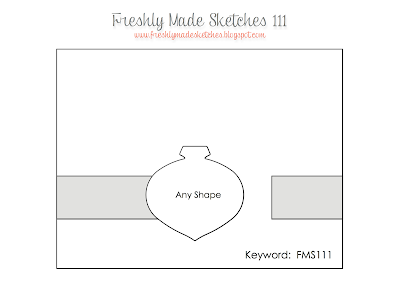 I do like this simply sketch! 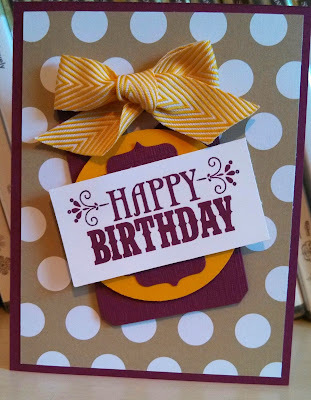 I still need more birthday cards since I have been making so many Christmas cards for so long! I do not need any more of those and I wanted a fresh and bright color combo so once again I turned to Bermuda Bay and my color coach for inspiration. I have a wonderful weekend ahead! My college girl comes home today!!! So excited! Enjoy your Friday and thanks for stopping by! I looked at this sketch a few weeks ago and thought, "I might not be able to do this one!" But when I sat down this week I started with the sentiment and knew I would do this one for my mom. Then I wanted some bright colors and my eye went right to my Bermuda Bay. So I got my color coach out and looked at a color combo and these are probably the brightest of the bright! I could not believe how it came together but really like and will use this sketch again in the spring! Happy Thursday to you and remember to SMILE! 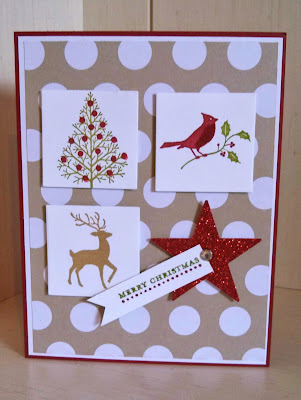 Another card using the Merry Little Christmas Simply Created card kit from page 27 in the Holiday catalog. 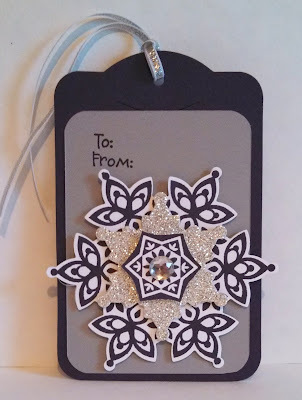 I colored in the presents and stamped on these great already pre-cut tags from the kits. Hope you enjoy your Wednesday and thanks for stopping by! I love this set and coloring in the snowmen. I also love how SU! provides kits like these where so much is cut and easy to assemble. 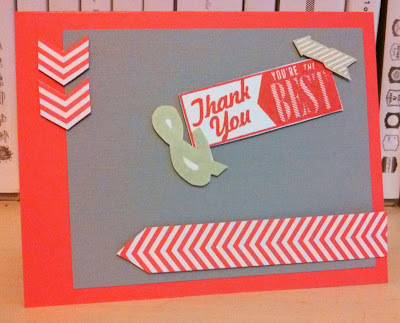 I added Real Red card stock behind the DSP on this card but everything else except the stamp set/ink came in kit! It is called Merry Little Christmas Simply Created card kit on page 27 of the Holiday catalog. Enjoy! 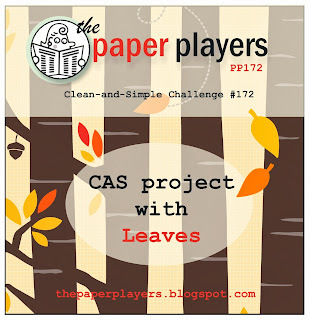 Well today is my first time playing with The Paper Players. I am trying to do more challenges and thought i would add a new one this week and probably another soon. I keep this clean and simple but a little vintage. 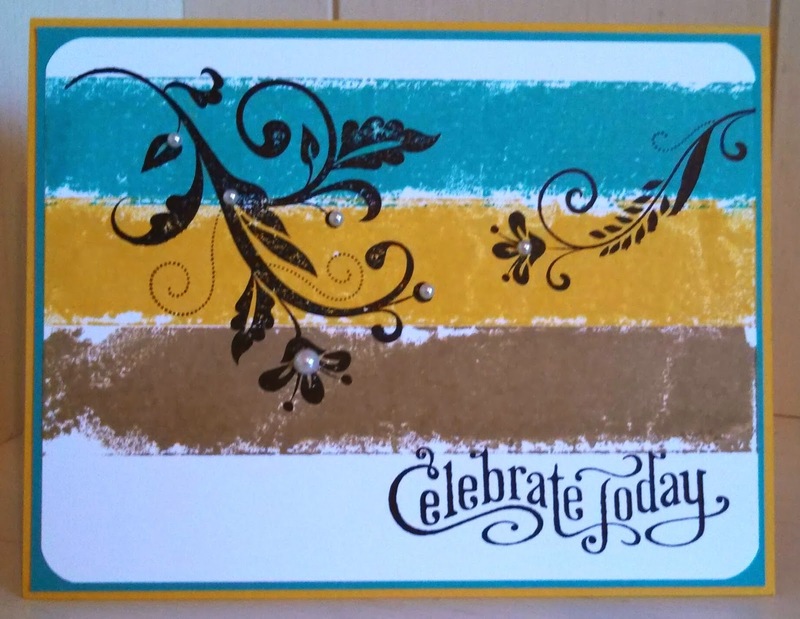 I stamped on Crumb cake card stock in gold ink for another project recently and feel in love with the look. 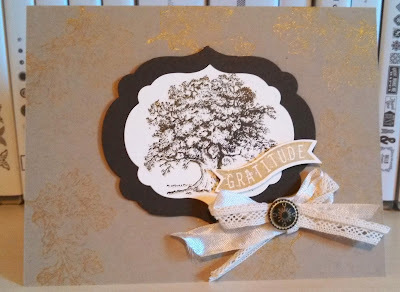 I turned to my Lovely As A Tree set for the leaves and saw a card the other day with this tree and remembered how much I like that stamp. Thanks for stopping by and hope your Monday is full of Gratitude! 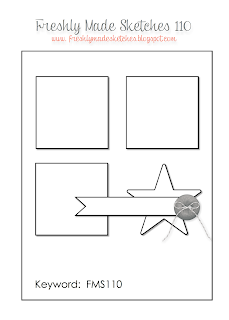 I was playing around with a layout for this card. 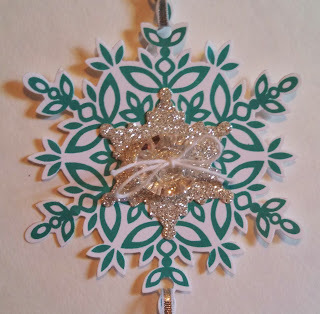 I like this ornament but it did not turn out so great with coloring in with marker. 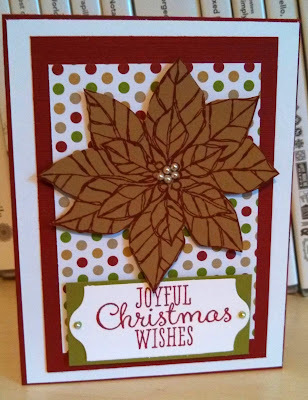 I wanted to make another card using the poinsettia but this time I did not emboss on my card stock and I have to say that I like the embossing better. I do like how the sentiment turned out. I love the font mix on that sentiment from Joyful Christmas! I liked this sketch. It was just different and since I knew my theme it was an easy and fast card to make. I only had to choose my colors. I wanted a blue/green combo and a yellow always goes well. I would normally grab first Midnight Muse, Gumball Green and Summer Starfruit because I know they coordinate together with out having to look at my color coach. But I thought about Wild Wasabi and how I never seem to use it. I like how simple but bold it turned out. The ink splashes do not show up so well here in the photo in Delightful Daffodil but they help give some texture to background. I thought this color challenge screamed birthday and so I grabbed a set I have not used in a while. You're Amazing is an awesome set but I forget about it. I love the hot air balloon in it and plan to use it again soon. Thanks for stopping by! Have a fabulous Thursday! I received washi tape at convention for free and then before I could use it, I lost it. I moved into a new stamping space and did not know where it could be. I bought some more of the Season of Style washi tape and the day after it arrived I found my stash that was inside a box inside of another box. I shook that box but never heard the tape rolls! My luck! So finally got to play with some last week and now posting a pic of it today. 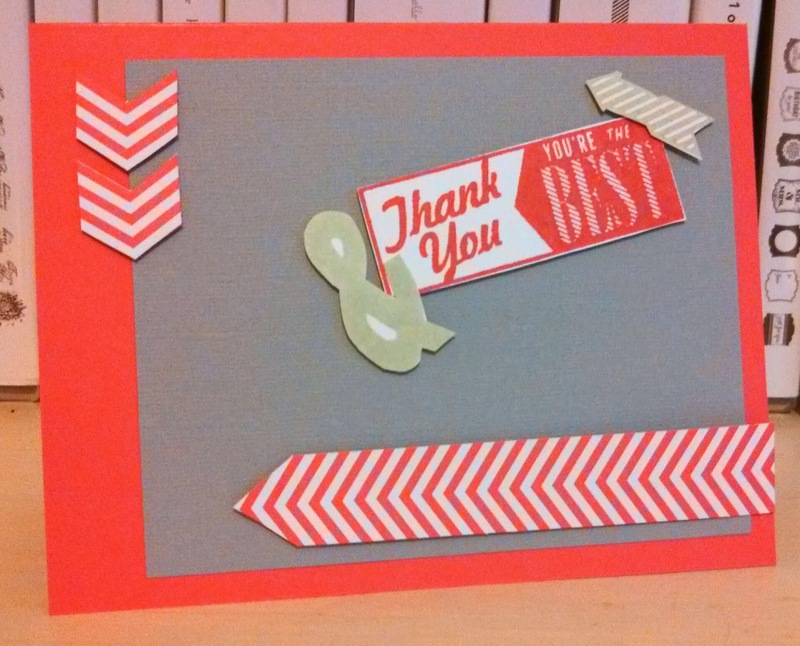 I cut the triangle with the pennant die and layered the tape on. 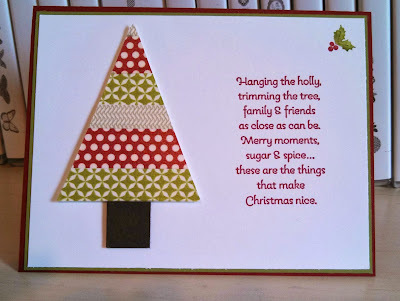 Cut a trunk from Early Espresso card stock and instant tree! I love these words from More Merry Messages that usually go inside but they fit so well with the tree that I wanted to feature them on the front of the card. Even found a little holly stamp in one of my retired sets! Hope you have a wonderful Wednesday and thanks for stopping by! 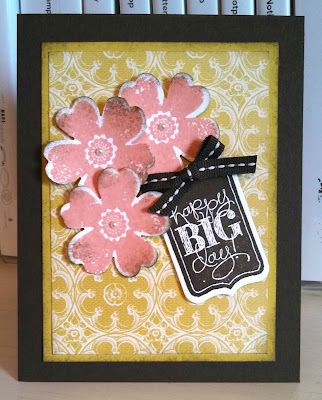 I made this card also at my friend Patti's house a few weeks ago. 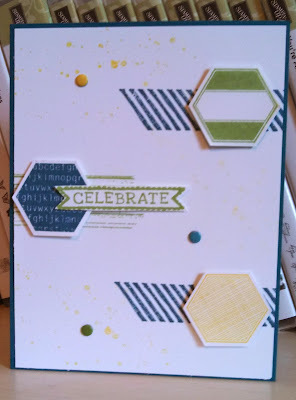 I had a great day getting to just stamp and not design anything for a class or someone else. 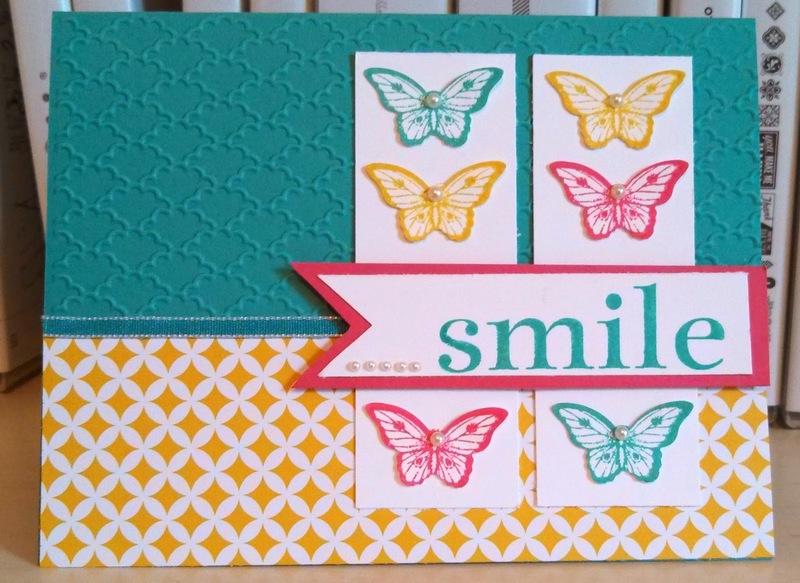 I love this stamp set and need to use a lot more than I do. Have a great Tuesday and thanks for stopping by! This is a card I made with my friend Patti a few weeks ago. I wanted to play around with colors that would compliment Bermuda Bay. I choose Baked Brown Sugar and Crushed Curry. I really like how it turned out. Could be a masculine or feminine card. Works for me! This technique is called masking tape technique. You can use masking tape or painter's tape (usually blue). 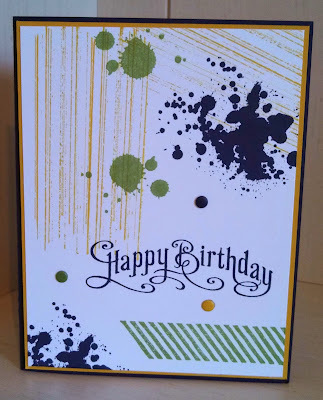 Ink up your tape on your ink pad one piece/color at a time and lay over the card stock. I lay all three down then smooth over the tape with my fingers and then pull them all up. 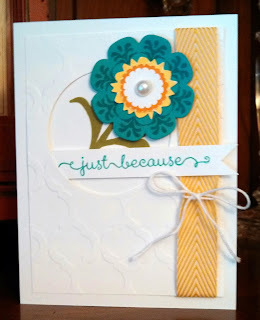 I used Whisper White here but like the effect with Glossy White card stock better. Hope you have a great Monday and thanks for stopping by! 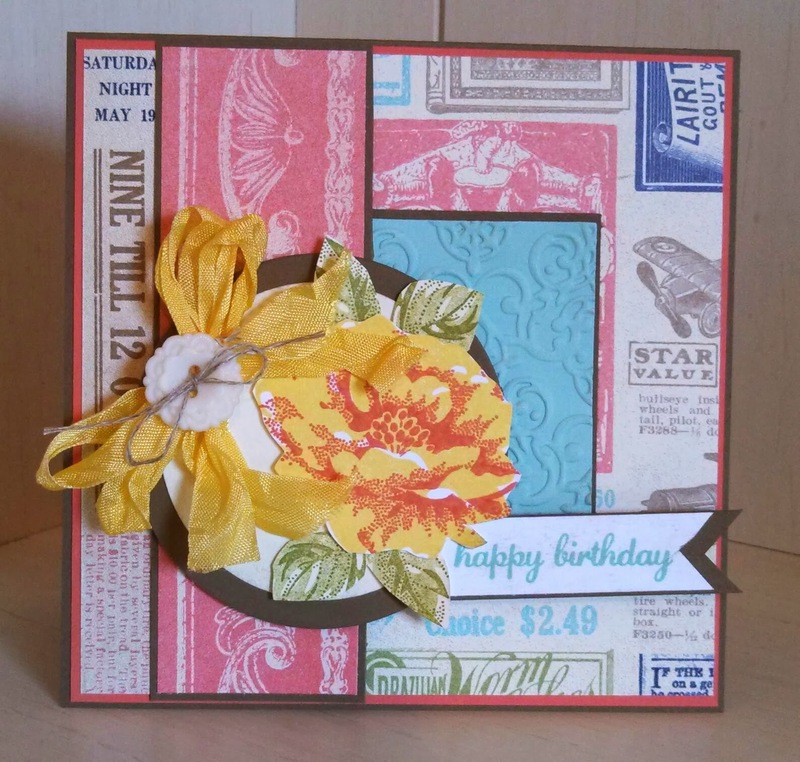 I wanted to make a special card with many layers for my friend Michaelle! She is so wonderful and a great friend to me! 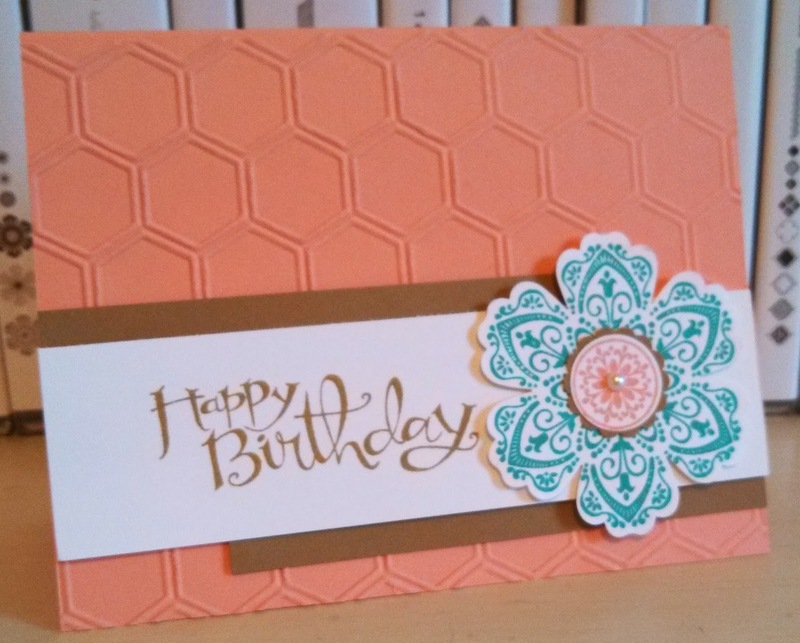 I have been stamping with her for many years (like 8 or 9) and so glad I get to see her several times a month to continue our hobby together. 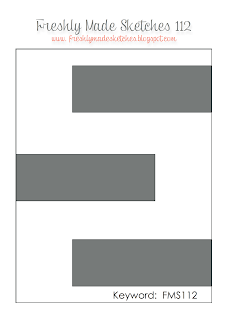 This card measures 5" square. I made this for my college girl and sent it last week. It is simple but she loved it! 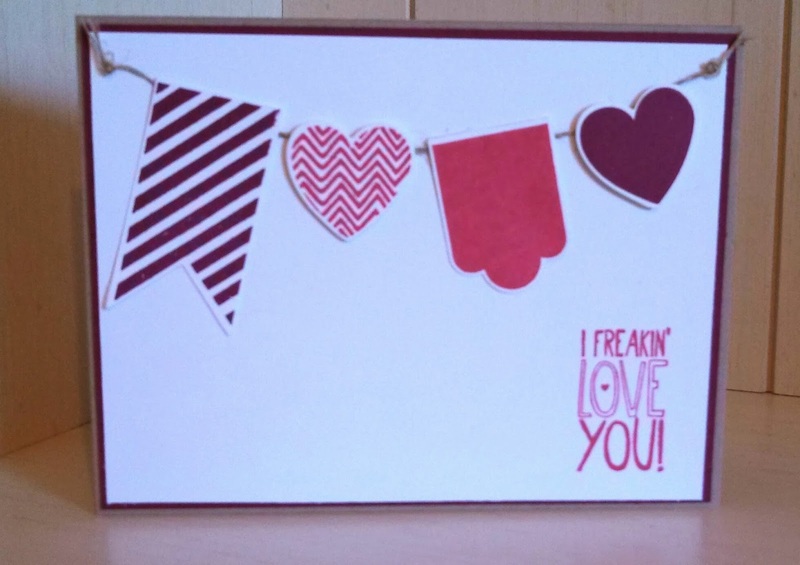 She has been hanging the cards on her wall over her desk! Love it. Hope she thinks about me when looks at them and how much I love and miss her while away! Have a wonderful Saturday and thanks for stopping by! 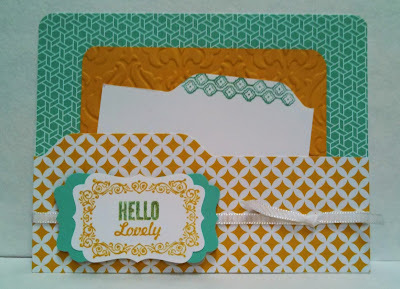 I love this single stamp and have not used it until now since I could not think of a layout I wanted to do with it. When I saw this sketch this week I knew it would be perfect. But colors? I thought of purple and silver and then thought I wanted to do something with red and gold again. This is the last bit of gold card stock I had except for a few small scraps and then the embossing in gold was calling to me! Enjoy this wonderful Friday and thanks for stopping by! I do like these colors together. I first thought of the different DSP that comes in these colors and then remembered I needed a birthday card coming up for one of my 9th grade girls that I teach in Sunday School. So I knew I would do birthday but did I want come up with my own layout or find one? 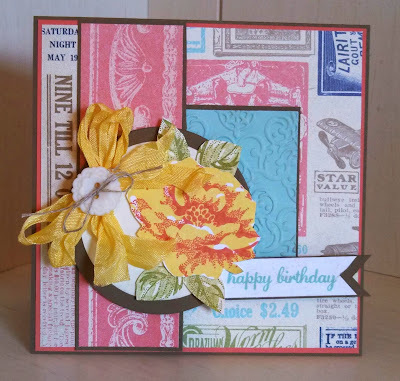 I decide to make my own and started grabbing stamps sets and this was what came together. Have an awesome Thursday and thanks for stopping by! 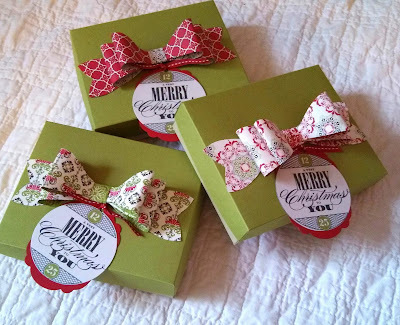 I made these boxes for the ladies that come to my card classes to carry home their Christmas cards this week. 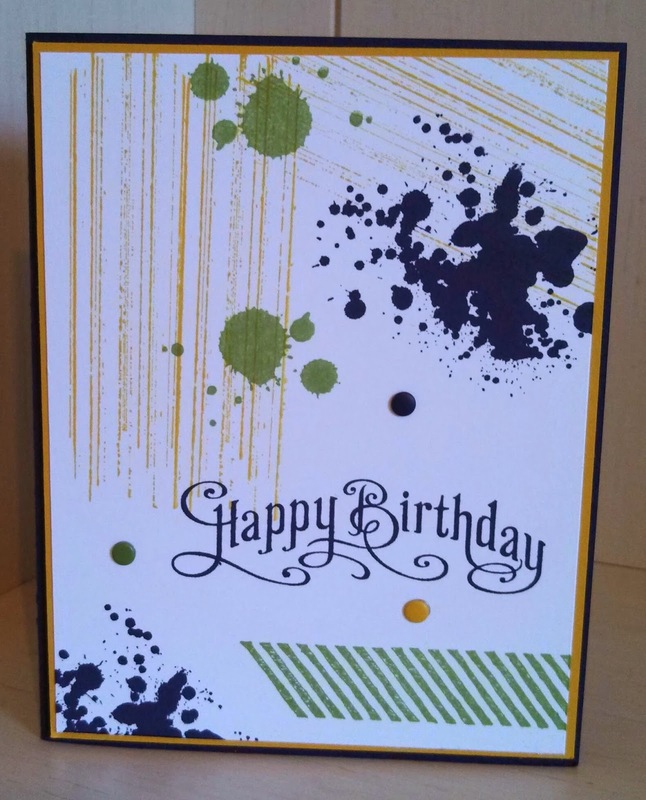 Easy box design with vanilla bottom and Lucky Limeade card stock on top. 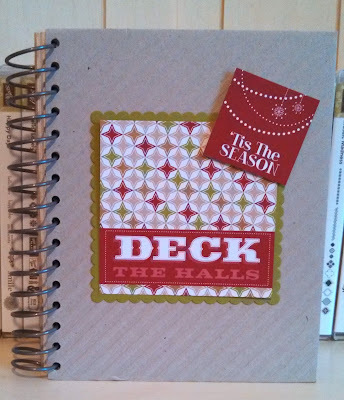 Great way to use up old retired card stock. For the bow I used retired DSP. Love using the SU! bow die. But what I am most proud of is printing some tags from MDS (My Digital Studio). Mostly because I do not use this resource like I should. 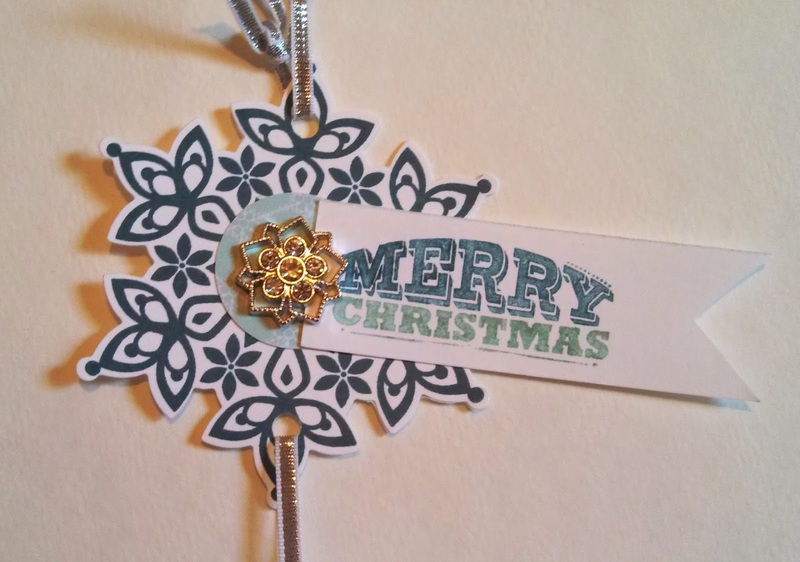 I layered on a die and put ribbon on top to make a tag. 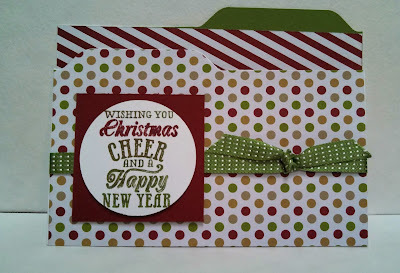 I attached to box with small glue dot some the recipient could take off and use on another gift box or bag. Awesome Christmas card by my friend Patti Carbonell. 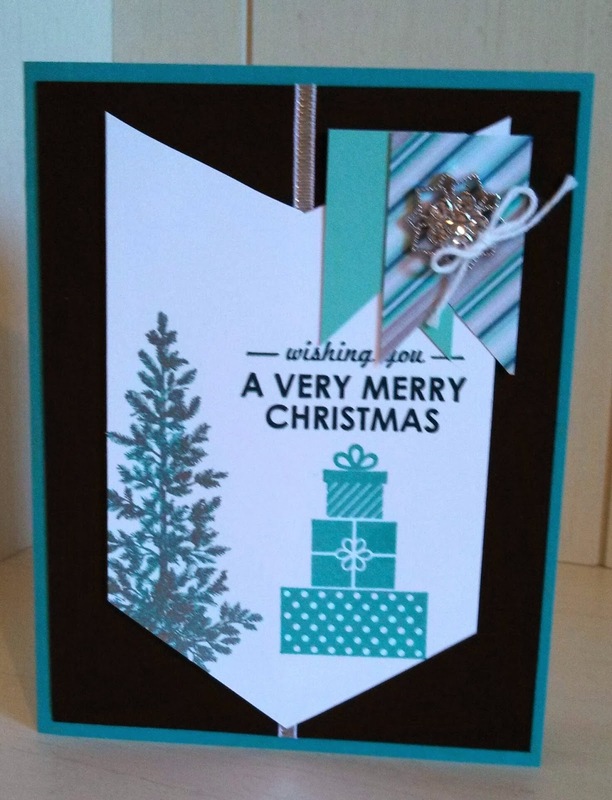 She first stamped the card using Coastal Cabana for the sentiment and the tree but decided too light so stamped over with black for sentiment and emboss in sliver on the tree. It gave an awesome effect which can see so much better in person. I also love the layout and bling at top! Hope you have a wonderful Tuesday and thanks for stopping by! 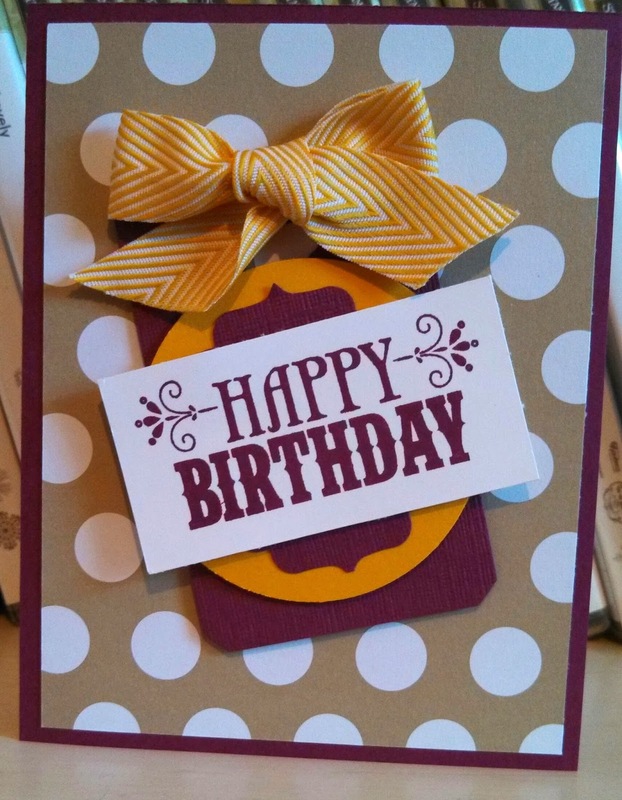 I made this file folder card to hold a gift card for my college girl! I will see her this Friday..Yay! I made is one with a front "pocket" by making the front panel lower and taping the sides to form a pocket or pouch. Great idea for a gift card or a photo or just a message. I saw these on Patty Bennett's blog at pattystamps.typepad.com. She has a how-to-make video and many different samples. My stamp club met a week ago and made some really awesome ones for birthday, Halloween and Christmas. I used the Envelope Punch Board to make the tabs like on a file folder. I plan to place a gift card inside. Have awesome Sunday and thanks for stopping by! This was an interesting sketch this week. I knew I would do Christmas card and my Warmth and Wonder was laying near by. It had three elements for three squares. I then thought about my star punch and glimmer paper! It came together easy after that. Hope you have a wonderful Saturday and thanks for stopping by! This is card I made at my friend Patti's house. We cased from the annual SU! catalog on page 203. It really is a nice layout that I plan to use again. 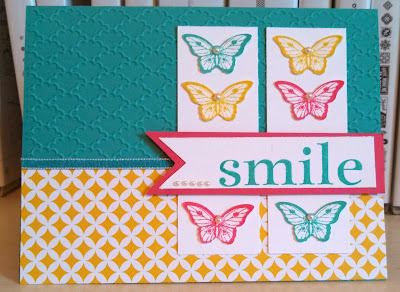 I do not have this stamp set but it will work with the many flower sets I do have. 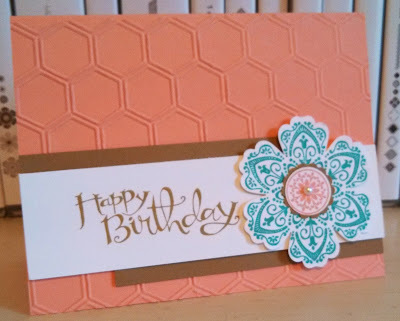 What I love about this card is it is colorful but only using Whisper White card stock. Hope you have a fabulous Friday and Happy first day of November!